I am a bit at a loss about the QX 56; it's a really nice, really large SUV. In fact when you're driving it, it seems larger than it really is. Maybe the QX 56 is just the right vehicle at the wrong time. The world is downsizing in reaction to the financial meltdown and even many of the still wealthy are hesitant to show off. So what once could have been considered luxury transportation now just looks insane. It is too bad really. If fuel were cheaper, the QX 56 would be the perfect vehicle to take on trips - plenty of room, commanding view of the road, comfort, and all the amenities you can ask for. Under the hood is a powerful (and thirsty) 5.6-liter V8 that really belongs in a muscle car - 320 hp and 393 lb-ft of torque. All of this drives through a 5-speed automatic transmission. The QX 56 I drove was a 2WD model; 4WD is available. Fuel economy for the 2WD is rated at 12-city and 18-highway; 4WD is 12-city and 17-highway. 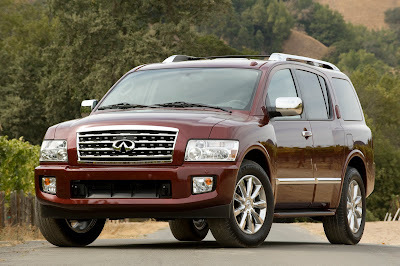 The QX 56 is 207" long and weighs (for the 2WD) 5,705 lbs. It will tow up to 9,000 lbs. If you have to have a huge SUV and you can afford the best, the QX 56 should be at the top of your list. The 2WD model lists at $56,050; the 4WD is $59,150.